2002-Apr-12: Hannover Messe 2002 is almost upon us, and OPC Foundation will once again be offering an update on the current status of OPC. More significantly, it will also be telling us where it plans to go over the next year or so. With this is mind, perhaps now is a good time to look back at what was said at Hannover 2001, and especially what we were told to expect over the year that has now just passed. So, how well has OPC Foundation delivered over the past year? Let's look at each of the projections from the slide above. 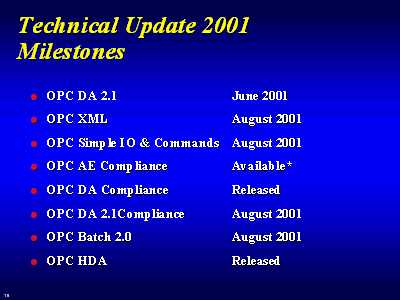 We'll also add in OPC Data Exchange (DX), which was announced in September 2001, with specification and sample code promised for December 2001.